This document is going to go through the bare minimum steps you need to take to set up a store and sell something simple like an eBook. The settings in Easy Digital Downloads are either required (like how your store sends you money) or have sensible defaults that you don't have to touch if you don't want to. We're going to cover only the required settings in this document. Follow the steps in this document and you should have a working store at the end. Easy Digital Downloads is available in the WordPress.org plugin repository, so the easiest way to install it is within WordPress itself. 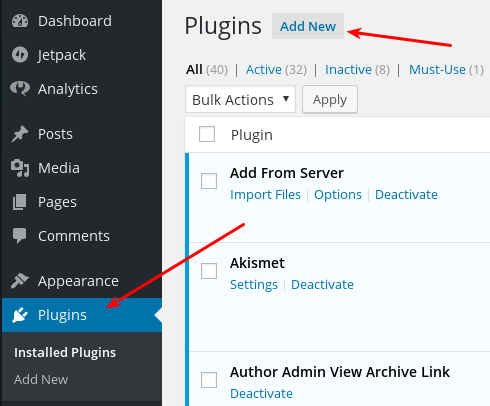 First go to the Plugins area in the WordPress admin, and on that page click the Add New button. Then in the top right of the next page put Easy Digital Downloads into the search field and press enter. Easy Digital Downloads should be the top search result, click the Install Now button you find in the EDD box. Clicking the Install Now button will show some information about the download and installation process, and then offer a link to Activate Plugin. Click Activate Plugin. 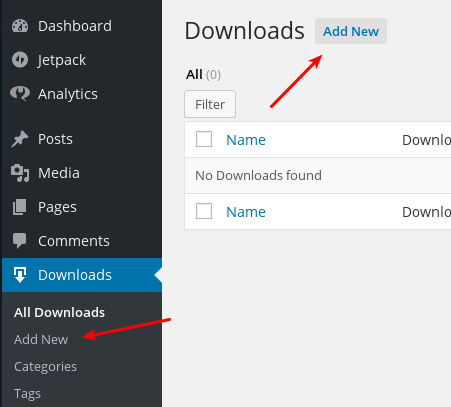 After you've activated the Easy Digital Downloads plugin you'll be taken to a Welcome screen, and there will be a new menu item in the left column of the WordPress menu called Downloads. Now Easy Digital Downloads is installed and ready to be configured. All settings for Easy Digital Downloads are in the WordPress admin. In the left column look for Downloads, and under there, Settings. General Settings is the first page you'll see under Settings. The only thing you need to set here is Store Location, which is probably where YOU are. Currency is the kind of money you'd like your store to accept. On the General Settings page, at the top is a link to Currency Settings. If you're in the United States you don't need to change anything here. If you're outside the US, make the proper settings there. These are the tools that let people pay money. EDD has built in PayPal Standard and Amazon. Both of these allow for paying with credit cards. Your customer wouldn't need a PayPal account, but they would need an Amazon account to use Amazon. Simply choose which ones you want to use and choose a default. It's possible to have may different Payment Gateways installed, but be careful not to enable more than one or two, else the customer could become confused about which to use. At the top of the Payment Gateways page is a link to the PayPal settings. The only thing required here is the email address associated with YOUR PayPal account. We have comprehensive documentation on setting up the Amazon Live Payments gateway. EDD has many more Payment Gateways available in the addons section of our web site. EDD has the ability to automatically send a variety of emails each time a sale occurs, including alerts to the store owner and receipts to the customer. Under the Emails tab, on the main screen for Emails nothing is actually required, but we recommend you upload a logo for your store. At the top of the Emails page is a link to Purchase Receipts. The only thing you really need to change here is the Name and Email that receipts will be sent from. This area only requires something from you if you wish to be emailed when a sale happens. If you do NOT wish to be emailed, skip this section. If you DO wish to receive an email for every sale, simply put your email address in the Sale Notification Emails box at the bottom of this page. Unless you need to configure taxes you're done at this point, your store should be fully functional. We recommend you finish reading this document however, it's short and sweet. You need to know whether you're required to charge taxes. If you are not, skip this section. If you are required to charge taxes fill out the form on this page. There is complete documentation on how to create products, but in this document we'll show you how to make a single basic product. To begin creating a product, click the Downloads link in the left column of the WordPress admin. On the resulting page you'll see an Add New link in the top of the page as well as in the left navigation. Clicking Add New will take you to a page where you can fill in information about your product. First enter a title and then some descriptive content about your product. You may include images in the description if you wish. Next we want to put in a price. There's a box called Download Prices and there's a field to put in a price. Next we need to upload our file (or add it from the media library if you've already uploaded). There's a box labelled Download Files. Leave the Product Type Options at Default for now, and click the Upload a File link. This will open the WordPress Media Manager. Upload your file or choose any existing file there. Once you've chosen your file the File Name and File URL fields will fill themselves in. You may change the File Name to anything you wish, but don't change the File URL. Lastly you may optionally add a Download Image. This is exactly the same process as for a Post, look for the box that says Download Image, click the Set Download Image link and either upload to choose from your Media Library. You've now installed Easy Digital Downloads, configured it, and created your first product. This is all you need for a basic store, but there are many more things you CAN do. Products can have categories and tags, you can set limits on downloads, and install extensions for more functionality. Information on how to do all of these things and more can be found in our Easy Digital Downloads documentation.